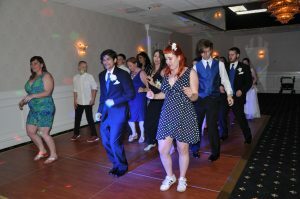 And We Danced DJ Entertainment had a memorable evening celebrating the marriage of Stephanie Winkler and Zach Shinall at the Atherton Hotel in State College on May 18, 2018. 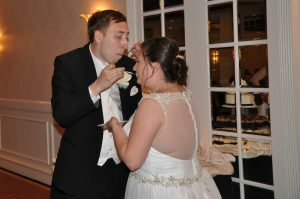 Stephanie wore a beautiful white gown from Formalities, and Zach was dressed in a marvelous black tuxedo with a white vest and tie. The bride’s theme colors were blue and silver. The bridesmaids wore royal blue gowns, while the men wore black tuxes with royal blue vests and ties. Both Zach and Stephanie are sci-fi enthusiasts, and it showed in their table layout at the Atherton. Tables didn’t have numbers, but names such as Hogwarts, U.S.S. Enterprise and Serenity. Jessica Jacoby, Atherton Hotel Wedding Planner and Sales Manager, and her staff did an outstanding job throughout the night keeping everyone happy. Delectable Delights supplied a beautiful two-layer cake alongside chocolate and vanilla cupcakes. The chocolate cupcakes were filled with a mouthwatering chocolate filling, and the vanilla were filled with lemon or raspberry. Woodring’s Floral Gardens created beautiful boutonnieres and bouquets for the bride, groom, bridesmaids, groomsmen and guests. 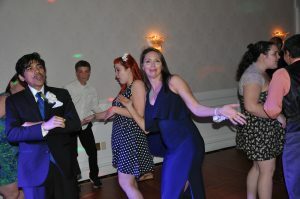 Daniel James Photography was quick to snap memorable moments throughout the night. 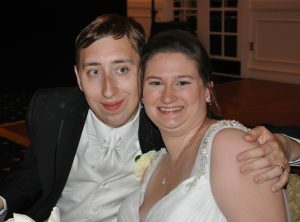 Zach and Stephanie met while in college. Both tried out for the debate team, and slowly realized they really cared for each other. They went off to further their education but remained committed in their long distance relationship. Today they are happy newlyweds. And We Danced DJ Entertainment had a marvelous time entertaining the brand new Shinall’s. Stephanie is quite the dancer and could be found quite frequently on the dance floor. 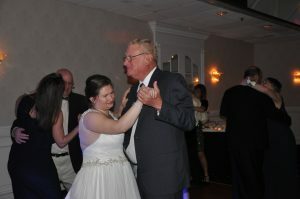 Old and young alike took to the floor for fast and slow dancing. 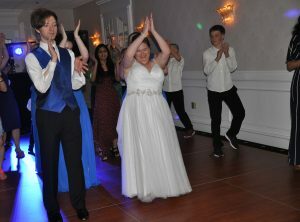 For the last dance of the night, everyone was on the dance floor celebrating and serenading the happy couple. 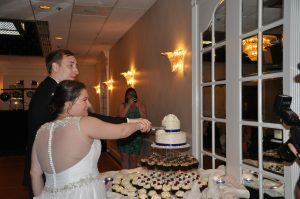 Thank you Zach and Stephanie for allowing And We Danced DJ Entertainment to be a part of your big day! 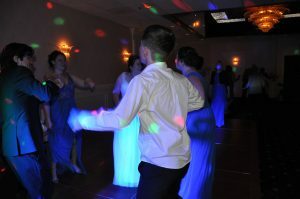 All photos in this blog post by And We Danced DJ Entertainment. Copyright © 2018. All rights reserved.